Longtime Silver Lake resident Mark Stambler's been baking bread for years -- I remember being impressed by his baking when our kids were in school together. Now that his son's nearly off to college, he's gotten way more ambitious and constructed a wood-burning brick bread oven in his backyard to bake his signature Pagnol loaves (It also bakes great pizza). And it's none too soon, since there is still a severe shortage of good bread in L.A., especially for those not near La Brea Bakery and BreadBar. Stambler gets up in the wee hours to start stoking his fire, waiting until his oven gets around 900 degrees to bake about 10 loaves of bread at a time. He attended the King Arthur Bread Baking Education Center in Vermont and avidly studies blogs and books like "The Bread Builders: Hearth Loaves and Masonry Ovens" on breadmaking and wild yeast. Since he cultivates his own wild yeast starter, the only ingredients in the bread are flour, water and salt. The batard-sized Pagnol loaves have a sturdy, chewy crust and a lovely beige crumb, due to the mixture of 70 % white flour and 30% freshly-ground whole grains like red winter wheat, rye and spelt. They're a bit heartier than soft white baguettes, but with none of the leaden quality of some whole wheat loaves. While he bakes just a small quantity each week, they're normally available for $8 at the Cheese Store of Silver Lake on Fridays and Saturdays until they run out. Stambler's bread will also be at the Food Rendezvous event in Venice on Aug. 28. This just in: the bread will also be available to members of the Silver Lake Farms CSA. Get info here. Want to really eat local? 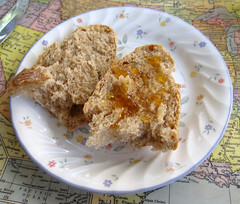 Try Mark's backyard bread with some Silver Lake honey from Feral Bee. And let me know if anyone else in the area is selling handmade foods we should know about. Great slice of Silver Lake life that I wouldn't have known about otherwise. Thanks. 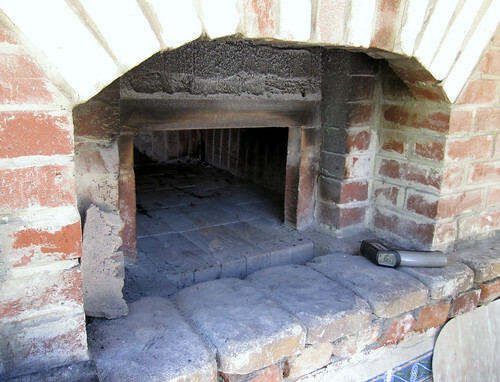 Oh, how cool would it be to have a full-on brick oven? Cool enough to have someone around who has one and knows how to use it. Yum. It is so difficult to find real good bread in this town, it amazes me. This is a great idea. Though I wouldn't mention La Brea Bakery for good bread anymore, they have gone industrial a while ago. Breadbar is still the best alternative for the best artisanal bread in town. I drive miles for it! great local bakery close to silver lake.. FRISCO bakery off San Fernando in Cypress Park. Has been there for years. some of the best sourdough bread in the city!! Not to mention the low prices, Dirt cheap!! they provide bread to most of L.A.s best spots. The Pantry & The Hat just to name a few..
Love local, neighborhood stories like this. I, too, was unaware of Mark's bread but now that I am I'll be making a special trip to the Cheese Shop. Thanks!